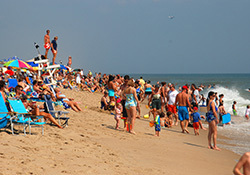 Learn about the beach replenishment project. Before you go to the beach, check out the rules. These take place on Thursdays from 8 - 10 pm on the beach off Campbell Place. June 20th will launch the bonfires with a DJ Dance Party on the Bandstand starting at 7 pm. Bonfires will continue on Thursday nights until August 29th. Movies on the Beach are shown Mondays at dusk on the beach off Garfield Parkway, June 171th - August 26th. Movies on the Bandstand are shown Friday nights at dusk in September.